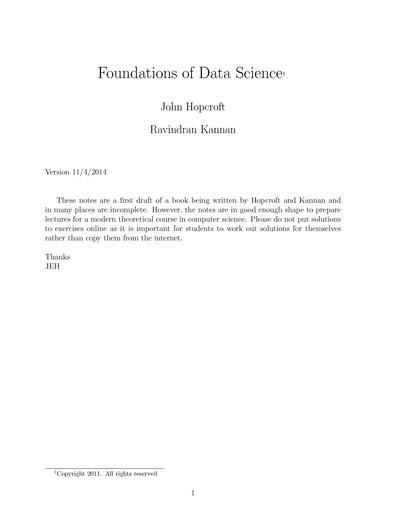 John Hopcroft and Ravindran Kannan wrote:Computer science as an academic discipline began in the 60’s. Emphasis was on programming languages, compilers, operating systems, and the mathematical theory that supported these areas. Courses in theoretical computer science covered finite automata, regular expressions, context free languages, and computability. In the 70’s, algorithms was added as an important component of theory. The emphasis was on making computers useful. Today, a fundamental change is taking place and the focus is more on applications. There are many reasons for this change. The merging of computing and communications has played an important role. The enhanced ability to observe, collect and store data in the natural sciences, in commerce, and in other fields calls for a change in our understanding of data and how to handle it in the modern setting. The emergence of the web and social networks, which are by far the largest such structures, presents both opportunities and challenges for theory. 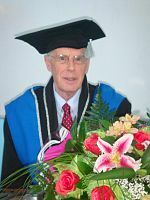 John E. Hopcroft is the IBM Professor of Engineering and Applied Mathematics in Computer Science at Cornell University. Hopcroft's research centers on theoretical aspects of computing, especially analysis of algorithms, automata theory, and graph algorithms. His most recent work is on the study of information capture and access. 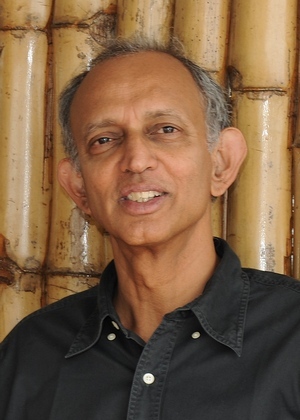 Ravindran Kannan is a Principal Researcher at Microsoft Research India, where he leads the algorithms research group. He is also the first adjunct faculty of Computer Science and Automation Department of Indian Institute of Science.